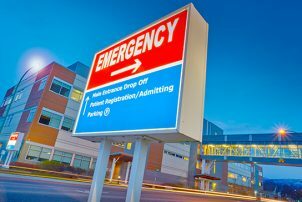 Parking challenges faced by hospitals vary greatly. The way in which the system is managed, can have a profound effect on the ever so important patient experience and their perception of the hospital. A hospital or medical facility must carefully balance the needs and expectation of its patients/visitors, physicians, and staff. All within the limited resources that many facilities have today. The trend of increasing daily bed census and overall daily patient services continues to put pressure on hospitals’ limited resources. The need to support a growing demand within a fixed parking supply is a real pressure administrators and facilities managers face. The challenges and constraints at each medical facility are unique and expectations of their patients and staff vary. Often patients and visitors have difficulty finding the correct parking location which serve the practice or clinic they have an appointment at. This usually occurs when the hospital has a series of parking facilities serving the campus. Other times there are either not enough physical parking spaces to support the campus operation or the available parking spaces are in inconvenient locations. The primary goal of providing valet services is an extension of the patient experience. The service reduces the burden of having to find a place to park then walk to the building, which can be challenging for non-ambulatory or aging patients. The valet staff must be knowledgeable and able to direct patients and visitors to destinations inside the hospital. 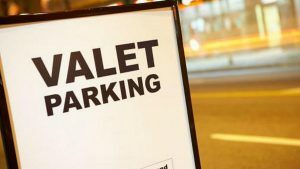 Highly utilized valet programs are provided for free of charge to patients and visitors, especially when the parking system is free. If the parking system is not free, a nominal fee is sometimes added in addition to the parking fee. Staff should be dressed in professional attire, deliver a high level of customer service, be located at primary building entrances, have sufficient staffing capable to overlap breaks, and be able to retrieve vehicles promptly so the patients and visitors are not waiting for an undesirable length of time. The parking system also benefits from a valet operation as it affords the opportunity to increase the density of parked vehicles within the same area of parking. This is achieved by double parking vehicles, sometimes referred to as stacked parking. 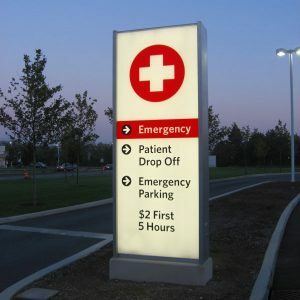 Signage and wayfinding are key elements to ensure a successful parking system for any facility. Signage and wayfinding should indicate both the primary destinations as well as the locations where parking is available to serve them. It is important that all signs have consistent branding and theming. They should have appropriately-sized text for drivers viewing distance, driving speed and reaction time to process information. Lastly, they should provide clear and concise information and balance the length of the message, not too much or too little. 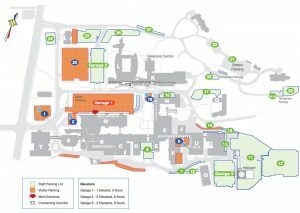 The facilities website, maps, and directions all play an important role for patients/visitors. Providing information on the facilities website such as rates, payment options, hours of operations, directions to parking, and destinations served by parking will help patients and visitors adequately prepare prior to arriving to the facility. Highly rated hospitals go so far as discussing these items during pre-admission telephone calls with patients. Having an appropriately designed parking guidance system throughout the campus can be a real benefit. Drivers can choose parking in advance of pulling into a facility based on real-time availability. 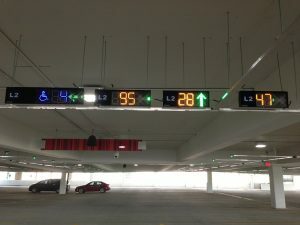 Once inside, the parking facility, the driver can find a parking spot quicker with dynamic signage indicating the level or area within the structure where parking is available. These systems can even show the driver each individual parking space that is open! The technology varies in complexity depending on the campus configuration. These systems offer an excellent opportunity for a successful patient experience. Access and payment technologies have also advanced. These new systems enable facilities and parking managers’ better access to data, fraud protection, improved records management, and auditability. Sometimes remote staff parking is necessary in order to provide the most convenient parking for patients and visitors. When the parking supply closest to the hospital is not adequate for both patients and staff, an employee shuttle may be necessary. While it may be seen by staff as burdensome, a shuttle strategy may provide operational benefits for the overall parking system. Remote employee parking is used on a temporary basis during construction projects. In some cases, remote parking with a shuttle program is less expensive to operate long-term than constructing new structured parking; though a proper cost analysis is required to determine this. There are operational considerations for employee shuttles that must be considered such as sizing the shuttle to meet peak demand periods, providing well-lit and maintained facilities, utilizing short headways between buses during shift changes, and providing enclosed waiting areas for staff waiting at the bus stops. Incentives are a welcome reward for employees who choose to participate in the shuttle program. A free cup of coffee, water bottle, or reduced meal in the cafeteria, while a small gesture, goes a long way for employee morale. You may have thought to yourself while reading this article; “while useful, these strategies are not specific enough to directly apply to my hospital or medical facility”. You’re right! Every facility and campus operates differently and the circumstances you experience, though not necessarily unique, they are specific to your operation. We at Walker develop the strategies and implementation plans specifically to meet the demands and requirements of your operation. Please get in touch with us so we can learn about your operation and work together to achieve a better parking and transportation operation for your patients, their families, visitors, and staff.